Damn! Sea lions got skills. 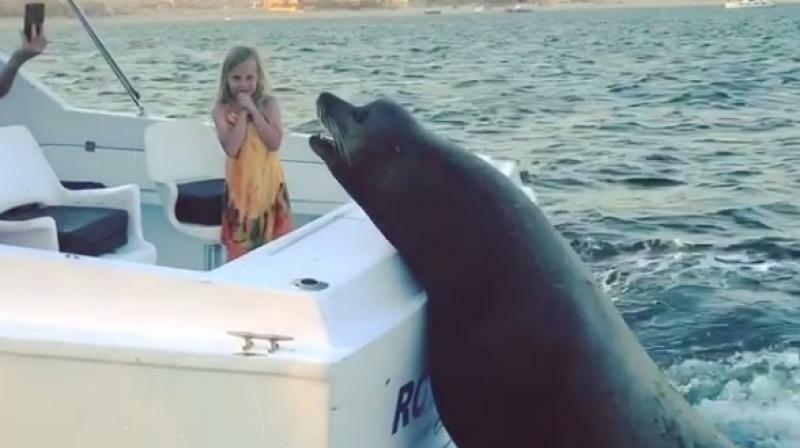 A gigantic sea lion saw what he wanted and relentlessly went after it. Lucky for us his mission was caught on camera. The video posted on Instagram, shows the marine creature manages to get itself on the back of a fishing boat because he spotted a yummy fish with his name all over it. Surf photographer Brent Bielmann posted the video with the caption: "We caught this guy ridin dirty a few weeks back in Cabo!" While people on board the boat were ecstatic, it looked like the aquatic animal was getting impatient watching a man dangle his meal. At one point, it looked like he grew so impatient that he wanted to jump closer towards the man with his fish. In the end, the sea lion finally got his grand prize and jumped off the boat hopefully a happy chappy. ■Video: Retired officer creates history with highest BASE jump!